While I was in Japan, I was taking a 3 hour Shinkansen to Osaka, during my dull and dreary trip I discovered a video about Bullet Journalling. Yes, bullet journal on a bullet train... how ironic. However it pulled me down a blackhole, and by the time my trip had concluded I had already consumed a good portion of the buljo video the Youtube community had to provide. So what do I do? Well, first and foremost I went and grabbed dinner because it had been a rather taxing trip. Then I went to the nearest stationery shop - which was painstakingly quite a distance away from my Airbnb - and grabbed a gridded notebook, pens and highlighters. Gridded, dotted or plain notebooks are usually the most popular when it comes to bullet journaling. Also, please take into account that a journal DOES NOT have to super artsy or fluffy or cute in any manner, I watched a few videos and people are crazy creative! But you do you! A journal is an extension of yourself, if you like drawing and sketching then add those elements in, but if you enjoy a simple layout and nothing too fancy then keep it minimal! Here's the gist: the bullet journal is based on a key system, which I have conveniently listed to the side, this key forms the basis on your journal and it's structure. You start off with a 'Yearly Log' where you list any events that are long term, then comes a 'Monthly Log' the same equivalent there and then a weekly... and if you're really that busy you can do a daily. When you're writing a specific log you're suppose to refer to the previous log, i.e. When writing your weekly log you refer to your monthly, and with your monthly you refer to your yearly. You guys get it, and if you want more information then you can visit this website here. Sections are usually referred to as 'spreads' (from what I can see) and so when you're planning out your weekly log people would say you laying a "weekly spread". Or sometimes if you want to do a mood board and habit tracker, that might be another separate spread. I've listed below a snapshot of some of the stationery I commonly use while journaling. Zebra Mildliners - Highly raved about in the buljo community, I just got them cause they were really accessible in Japan, colours are really pretty and come with a large variety. Faber Castell Pitt Artist Pens - Recommended by a Youtube: AmandaRachLee, she predominantly uses these 4 assortment of pens for her journaling and calligraphy. White Uniball Signo Pen - Just an "eraser" pen in case I make any mistakes... which I do pretty often. Any white pen or whiteout will suffice. Ball Point Pens and Pencils - I have my cute Studio Ghibli pens in the photo for aesthetic purposes but I usually use this rather boring one when I'm just jotting things down on the go. I usually use the ballpoints for my actual tasks or notes and the Pitt Artist Pens for drawing out my spreads. Pencils are usually used for markings or drafting a spread before I ink it down permenantly, good idea for beginners or if you're prone to making errors like me! I've been trying to stick to certain themes during each month, April is paper/origami themed? I'm not super strict with it, but it forces me to be a little more experimentational when I lay out my spreads. 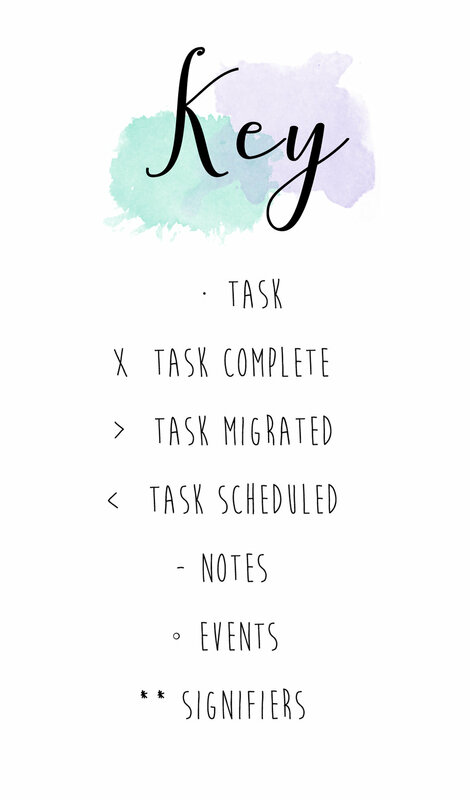 Spreads that I don't use but other people do include: habit trackers, grocery lists, period trackers, present lists, birthday calendars... pretty much whatever you want. The bullet journal is suppose to cater to your needs and what you would like in a personal organiser that you can't gain from a store bought one. The only issue I've run into whilst I've been journaling is that the notebook I purchased - despite the fact that it has 200 pages - has really poor GSM, and so most of my writing or inking does leak through. As you can see from the image above, but there are heaps of amazing notebooks out there, Leuchtturm, Scribbles that Matter, Moleskin Classic... Some of these can be on the pricier side and so if you don't want to spend an arm a leg any notebook will do the trick! Anyways, there isn't much else left to say, I'm going to start updating regularly on my journaling so you can see the journey of my journal and also my calligraphy skills, which at the moment is non-existent. If you're thinking about starting or anything like that I'd definitely recommend it! Even if you're not artistic or have no idea what you want, the best thing about this concept is that there aren't any rules or reason, it's what caters towards you specifically!